Invitation: Closing Ceremony - Year Long 1857 Celebration! Invitation: Closing Ceremony – Year Long 1857 Celebration! 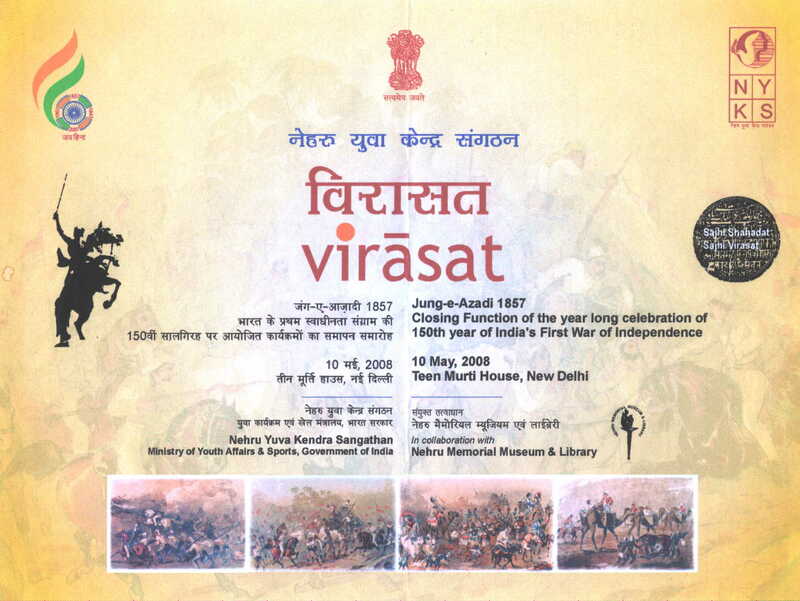 The Nehru Memorial Museum and Library (NMML) in collaboration with the Nehru Yuva Kendra Sangathan (NYKS) will be organising the closing ceremony of the year long programmes of 150 years of the Great Revolt of 1857 on Saturday, 10th May 2008. On this ocassion, a programme will be held in the back lawn of the Nehru Memorial Museum from 5 pm onwards. There will be cultural performances by school children. The programme will include speeches by Shri Arjun Singh (HRD Minister), Shri MS Gill (Minister of State for Youth Affairs and Sport), Prof. Bipan Chandra and Dr. Shakeel Ahmad Khan (Director General, Nehru Yuva Kendra Sangathan).